A mother expecting triplets documented her growing baby bump – and the pictures are extraordinary! 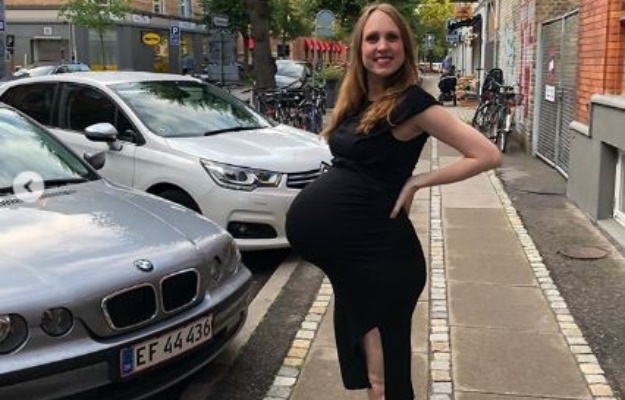 A 36-year-old woman from Denmark in Copenhagen has documented her pregnancy with triplets in week-by-week snaps of her belly, reports Daily Mail. Maria documented the highs and lows she’s experienced with pregnancy on her Instagram page and now has more than 69 000 followers on the social media network as a result. She and her husband, Anders (40), already have a 2-year-old son named Mikael and her triplets were conceived naturally – without the use of IVF or any other fertility treatment, writes boredpanda. Maria – who’s originally from Norway – also documented how she and her husband have made changes to their lives to accommodate the three future family members, such as swapping their trendy hybrid SUV for a more practical minibus that can accommodate the entire family. Her humungous protruding belly almost dwarfs her tiny frame, displaying a tributary of veins as it stretches out from her body. Maria and her husband tied the knot in June of this year after meeting four years ago on Tinder. The mother-of-one has admitted that it’s strange that her tummy could protrude so far outwards without falling down, writes New Zealand Herald. In another post she wrote, “What a journey this has been! From the huge shock of learning there were three, to people’s reactions, the numerous scannings/checks and all the preparations and planning for this life-changing event. Nothing like the ordinary.